If you're a fan of the drive-through -- or even if you just partake in fast food when you're on road trips -- you are probably always seeking ways to lower your fast food budget. Burger King's phone app, which is free for Android and iOS has coupons and deals for frequent diners. When you first launch the Burger King app, you'll have several options that you can select. First, tap the "Offers" icon, which will show you the current deals. If you tap "Redeem" on the offers, it will ask you to create a free account, and then will show you the redemption screen, which is simply a code to give the cashier so that you can get your discounted item. After you've perused the coupons, you should check out the Rewards feature of the app. The system works much like any rewards program -- as you spend money using your rewards account, you'll collect points (or "Crowns" in this case), which you can later redeem for free food. The coupons rotate frequently, so if you see a deal you really want, don't hesitate to redeem it. When you spend your first $5 at BK, you'll unlock 50 Crowns to get you started. To earn Crowns, you'll tap "Earn BK Crowns" in the app and then a code will be shown on your phone. Give that code to the cashier, and when you spend money, the Crowns will be added to your account. In addition to earning Crowns by purchasing items at Burger King, you can also earn them by paying with your mobile wallet, which you can access on the app. Once you activate it, you can load funds directly to your virtual gift card, and then pay using the app. Each time you pay for your food using the app, you'll get 20 percent more BK Crowns than you would have if you'd just paid with cash or a debit card. If you happen to have a Burger King gift card, you can load it onto the app so you can still get the benefits and earn additional Crowns. 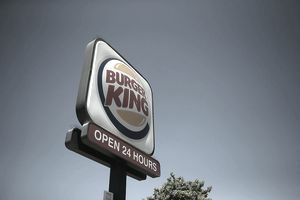 The Burger King app includes a way to find the restaurant nearest you at any given time and a way to track your activity at the company's restaurants. The app also provides nutritional information for all menu items, from Whoppers to fries to salads. If you're counting calories this is a good way to indulge your craving for a burger without overdoing it. As with any app that enables financial transactions, it's a good idea to be aware of what permissions you're giving the Burger King app before downloading. This app needs permission to access your identity, location, photos, wi-fi and Bluetooth connection information, and your device's ID and call information. Be sure you're OK with allowing this level of access before downloading the app.